The classic flat circle… the versatile French Beret! Here, contrasting colors and/or textures add a little zip and personality to the classic. Because it uses only partial skeins of 2 colors or textures, this hat is a beautiful way to use up the remnants in your stash. It’s a quick project, working up in less than 3 hours, and is a great holiday gift. 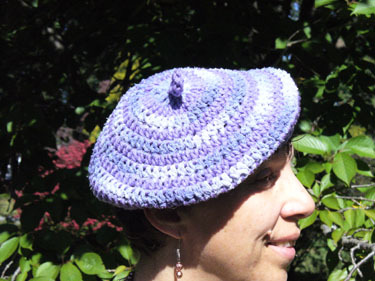 Size: Finished Beret is 9.5″ diameter and fits most adult women’s heads. Standard felt beret sizes are 9″ and 10″, and the band of this one stretches, which the traditional felt berets do not. 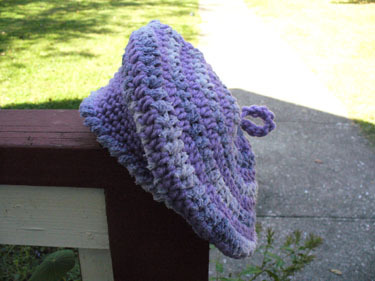 A 7.75″ (child size) beret can be made by skipping rounds 7 & 8. Approx. Yardage: Any color, 130-140 yds. Gauge: Working in half-double crochet, 12 sts and 8 rows (alternating yarns, as in pattern) equals 4 inches. Magic Ring Place a slip knot on the hook, leaving a 9 in. tail. Wrap the tail once around your finger to form a ring. Holding the ring together, slip stitch into the ring, then work the number of chain and stitches specified for the first round. The ring will loosen somewhat as you work. When Round 1 is complete, pull tail firmly, on the wrong side, to tighten. Insert hook into next stitch and draw up a loop. Repeat in next stitch, yarn over and pull through all loops on hook. See http://crochet.about.com/library/weekly/aa112997.htm for a tutorial. Color changes are done in the slip stitch joining the end of each round, as follows: with loop of current yarn on hook, insert hook into indicated ch. Yarn over with the new yarn, and draw that loop through. Continue stitching, allowing the unused yarn to hang from the wrong side of the work. It will be picked up in the next row, at that same spot. Entire hat is worked in rounds with right side facing. Stitch counts are at the end of directions for each round. Chain 2 at the beginning of each hdc round counts as first stitch (beg hdc) for that round. Ch 1 at the beginning of each sc round does not count as a stitch. Rounds 14-17 Ch 1, sc in same st as joining and each st around, join with a sl st in ch 1. At end of Round 17, fasten off MC. Round 18 Join CC with a sl st in 1st st of Round 17. Work around edge in rsc and join at end of round. Fasten off. With MC, ch 10, sl st in each ch. Fasten off. Thread beginning tail through 10th chain to form a ring. Thread beginning and ending tails of yarn through hole in center of Magic ring, and tie securely to any stitch on wrong side of round 1.